I remember exactly what I was doing when I first heard about the Challenger disaster – the bell had just rung for third period to be dismissed. Nobody had time to collect books and leave when Mrs. Haas stepped into Mrs. Fleck’s science class, with tears in her eyes. “The space shuttle just exploded – it just exploded.” January 28, 1986. I was in seventh grade when this happened and did not quite grasp the enormity of the event. I understood it was a terrible tragedy. I sort of understood that space flight was very risky. I did not understand how uniquely different this particular shuttle mission was until later. It is not until you become an adult that certain things and emotions take on more meaning or significance. Watching the historic news footage yesterday about Challenger had my stomach in knots. Why? The seven people on Challenger were living their dream. They were taking their part in an amazing story about space exploration. A real life teacher was on board – the first private citizen to participate in the shuttle program. She had lessons that were going to be taught from space. That is what made this shuttle mission unique. This inspires me to always set goals that are challenging and scary. The dream – we should all have one. 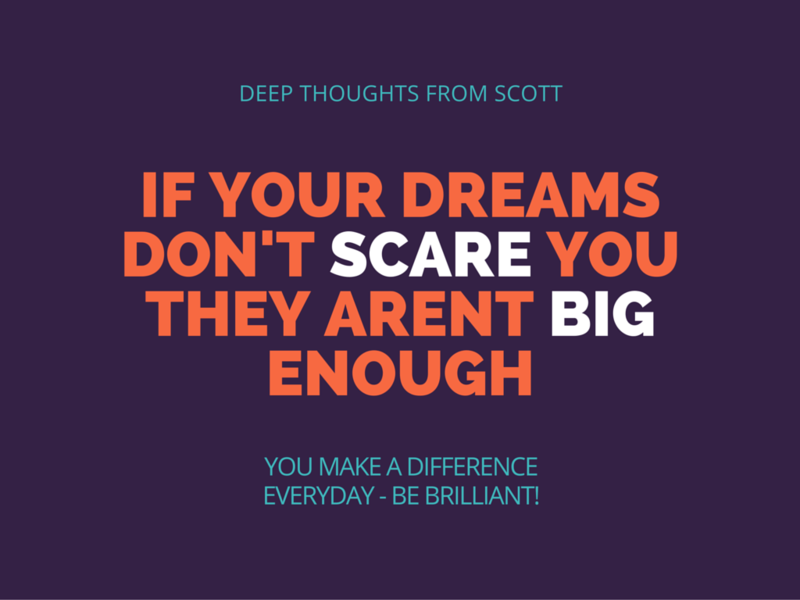 Dreams can be scary or exciting or both at the same time. I would imagine that riding a rocket into space would qualify. Ask yourself what your dream is – if you can’t answer this question yet, give it some thought. What is it that you would really like to do or accomplish? What would be the most terrifying and exhilarating thing you would do? What kind of footprint do you want to leave for others? Maybe your dream is to write a book about teaching. Maybe your dream is to be your district teacher of the year. Maybe your dream is to lead a school district or run for office or be the president or start a business to help ____________. Find your dream, a dream that scares you. A dream so big you could not even imagine what it would be like to achieve it. Then allow yourself to work toward that dream. Can you make your dream a reality? I have a book idea bouncing around my brain. Which terrifies me – I do not consider myself a writer. At all. Who would want to read it? Who would want to publish it? Who would waste money on it? What if it sold 1 million copies and made the New York Times list….This is a big dream. I want to give a TED Talk. At the TED Conference. The one that is basically impossible to get into. That one. Give a talk that goes viral….A scary dream to be sure. One Response to "The Challenger and The Dream"
I thought immediately about the families that lost their loved ones. Especially the husband and children of Christie McCullough. As a teacher, I deeply identified with her and admired her courage to go into space and teach lessons from there.